BFBOX Version 2.0 is a "secure data box" to store sensitive user data such as user names, passwords, lock combinations, account numbers, product keys, credit card numbers, PIN's and other identity numbers. User data is encrypted using the Blowfish algorithm with 448-bit keyword, then stored inside the BFBOX.EXE executable file itself. Decrypted user data is displayed to the monitor only. It is never written to disk. For security against keylogging, screen capture malware and phishing, install BFBOX on a computer that is never connected to the internet. BFBOX runs under Windows 2000, XP, or 32-bit Windows 7. To download click on BFBOX2_0.EXE (1.1MB) then select "Save as" or "Save". 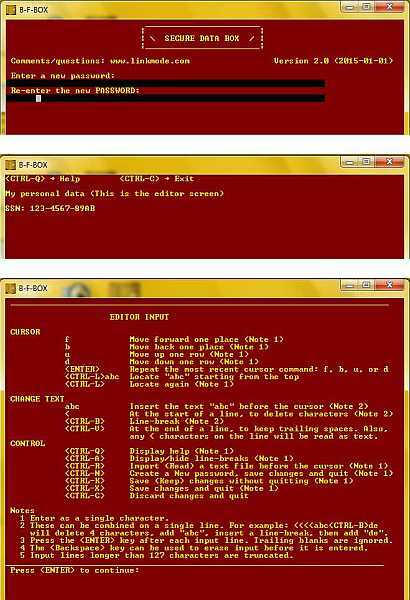 To install double click on the saved BFBOX2_0.EXE file. To download Fortran source code for the blowfish algorithm (for software developers) click on Blowfish_for.zip (33KB) then select "Save as" or "Save". SBOX Version 5-23-2013 has been replaced by BFBOX. FMTQ Version 2.0 is a program that checks audio file extensions and formats. All the files in a user-selected directory are checked, including subdirectories. The user also specifies which audio file types are allowed: MP3, WMA, and/or WAV. Many music players do not behave well when they encounter unrecognized file formats. Before downloading music files to a music player, FMTQ can be used to ensure that all of the files have one of the specified formats. FMTQ will run under Windows 2000, XP, 7 (32 or 64-bit), 8, or 10. To download click on FMTQ.EXE (950 KB) then select "Save as" or "Save". To run, double-click on the saved FMTQ.EXE file. 1) WGEN generates an audio file with a specified waveform. 2) WRATE changes the sampling rate of an audio file. 3) WANA analyzes an audio music file for amplitude, tuning error, key, etc. 4) WALTER changes the loudness, speed, and/or pitch of an audio file. 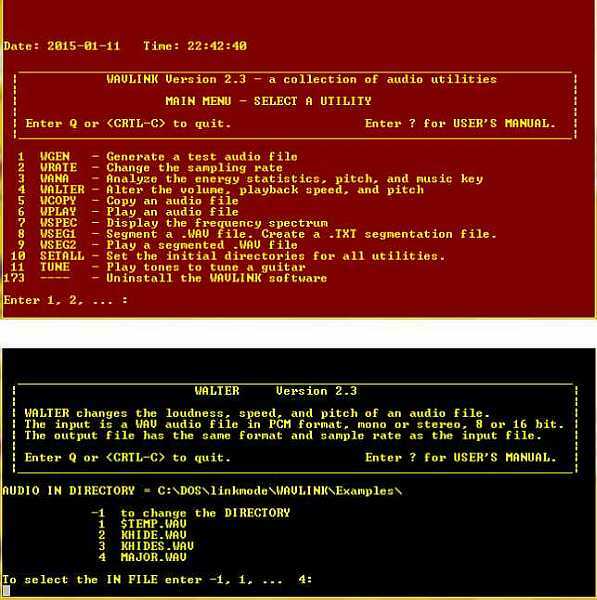 5) WCOPY checks and displays the format of an audio file, then creates a copy of the file. 6) WPLAY plays an audio file. 7) WSPEC calculates and displays the spectrum of an audio file. 8) WSEG1 segments an audio file and ceates a .TXT segmentation file. 9) WSEG2 plays segments of an audio file, as specified in the above segmentation file. 10) SETALL initiallizes all WAVLINK directories to a single specified directory. 11) TUNE plays a sequence of six tones to tune a guitar (Spanish tuning). To download click on WAVLINK2_3.EXE (16.6 MB) then select "Save as" or "Save". To install double click on the saved WAVLINK2_3.EXE file. WLINK Version 2.2 is a collection of ten utilities to process WAV audio files. It has been replaced by WAVLINK. To download click on WLINK2_2.EXE (15.9 MB) then select "Save as" or "Save". To install double click on the saved WLINK2_2.EXE file.